Humans and softshell turtles have a long history, not usually to the benefit of the turtles. The various species have been exploited for their meat throughout their extensive range. A few species also appear for sale as pets, although they are not the easiest of animals to maintain. Softshell turtles have exactly the sort of shell the name suggests, being more like leather than the hard bony material of other turtles. Softshells have lost most of the bone of the typical turtle shell and all the horny scales. Some bone remains in the center, but much of their carapace is just thick skin, which provides some protection against predators, although not as much as a full shell. Another striking characteristic is the face, which has a pointed snout. About 25 species of softshell turtle are spread across four continents -- North America, Australia, Asia and Africa. The species figure is not definite because some softshells currently listed as a single species might actually be several different ones. All these turtles inhabit freshwater habitats -- the leatherback sea turtle might also have a softish shell, but it is not at all closely related. Most softshells are predators, eating a diet of invertebrates, fish and amphibians, but some eat a more varied diet that includes plant material. 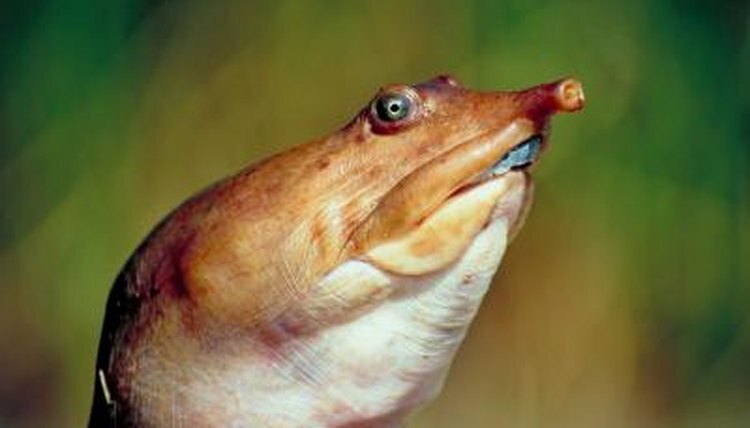 Several species of softshell turtle are endangered, for example Cantor’s giant softshell (Pelochelys cantorii), and others are vulnerable. The main threats are habitat destruction, water pollution and overhunting -- softshell turtles are edible and sometimes heavily exploited. The pet trade might play a minor role in threatening some species through over-collection, although the ones that appear most often for sale are not in any danger at present. Several species of softshell turtle appear in the pet trade, all with different needs. The ones you are most likely to encounter are the Florida softshell (Apalone ferox) and the smooth softshell (Apalone mutica). Eastern spiny softshells (Apalone spinifera) also occasionally make an appearance. As pets, they need a very large tank, or a secure outdoor pond if the climate is suitable, with a land area for basking. Their diet should mimic what they eat in the wild, usually a variety of live invertebrate prey. Note that these turtles rarely bond closely with humans, get scared easily and can inflict painful bites, meaning that they are certainly not a “hands-on” pet or suitable for children.